The Student Affairs Collective is a premier niche online destination for 1000s of Student Affairs Professionals looking to learn and grow from each other. Our readers currently hold, or aspire to hold, academic titles such as Dean, Vice President, Director and Advisor in the Student Affairs or co-curricular side of an institution. 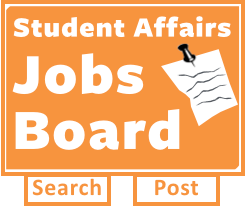 Our jobs board is an extension of all the services we provide to the Student Affairs community. Get pushed out within 7 days to our newsletter with around 3,100 Student Affairs subscribers. Get pushed out within 7 days via our Twitter account (@The_SA_Blog) with around 26,000 followers. Get shared on the Student Affairs Facebook Group with 19,000 Fans. We are more than a jobs board, we are a community of Student Affairs Professionals helping each other reach new levels of success. All of this should help to give you a nice boost in potential applicants.